We think that the easiest way to find your way around a city is to choose a centre point and then divide the city into smaller districts. Manchester has a large city centre and many centre points including Piccadilly Gardens, Exchange Square and St Peter's Square. We have though chosen the Town Hall which is sited on Albert Square as our centre point. From here you can get to anywhere in the city centre within fifteen minutes. We have divided Manchester into four districts, and each district is divided into smaller chunks too. The areas are: the City Centre, quite large with many of Manchester's main attractions including the Arndale shopping centre, Northern Quarter, home to Manchester's independent retailers and Salford Riverside, just moments away from Manchester's shops; the Inner City, home to the University Quarter and Central Salford; the Manchester Suburbs, the outskirts of the city with good motorway access and ideal for business travellers, home to Salford Quays, Old Trafford and the Trafford Centre; and finally Greater Manchester which includes Bury, Bolton, Stockport, Trafford and Oldham. For simplicity, we have included Salford and parts of some other boroughs within the Manchester districts. This is the very heart of the city and home to the Town Hall and the Museum of Science and Industry (MOSI). 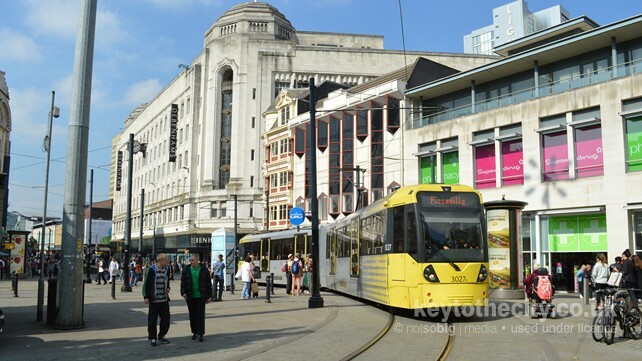 Shops can mainly be found on Market Street, King Street area and in the Arndale Centre. Parking is relatively abundant but can be costly. Manchester's Inner City is home to the University Quarter in the south east, Sport City featuring Manchester City FC and the Velopark in the east, First Street in the south and Central Salford in the west. Manchester is a big city and you have to venture out of the city centre to reach many of its attractions. Heaton Park to the north is the city's biggest outdoor space, or venture across to Salford for The Lowry or to Trafford Park for the Trafford Shopping Centre. The Greater Manchester region extends to Trafford, Bury, Oldham, Bolton, Stockport and Tameside. We hope to add more visitor attractions in the coming months. Map showing our centre point for Manchester. Use the links below to view Manchester on popular mapping websites.